Tobey’s story began in the same shelter where Nikki found Zoie, Nino, and Buck. When Nikki saw his photo, she saw a sadness in his eyes that drove her to rescue him. 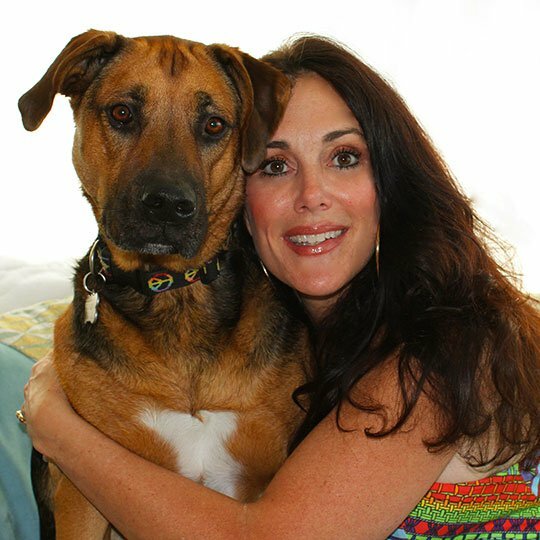 Nikki knew that as a brown, mixed- breed dog, Tobey would likely have been euthanized, as brown dogs, along with black ones, are some of the last to get adopted from shelters. Tobey was close to two years old when Nikki rescued him in May 2012. Heartworm positive, Tobey lived with a foster for three months so he could undergo treatment before joining the rest of the pack. When he first arrived at Nikki’s home, Tobey was still underweight and not yet fully developed. He didn’t know commands nor did he respond to his name for many months. Since living with Nikki the past three years, Tobey’s gained almost forty pounds and has blossomed into an incredibly handsome dog, who gallops like a horse through the courtyard in search of one of his brothers or sisters to play with. Initially shy and withdrawn, Tobey has found his confidence these days, plopping himself down next to Nikki on the recreation room couch, seeking love and attention. Fortunately for Tobey, Nikki saw his photo and rescued him, sparing him a deadly fate that tens of thousands of dogs and cats face each and every day in the United States alone.